While it feels like the final season of Games of Thrones have been teased forever, we haven’t actually seen much of what to expect from the final six episodes. So it’s a great treat to see new footage in the form of an official trailer and, if you’re a fan of the series, man will it get you hype. The trailer opens with shots of Arya running away from… something? someone? We aren’t sure, but she’s clearly deathly afraid of it, despite her voiceover welcoming the “many faces” of death. 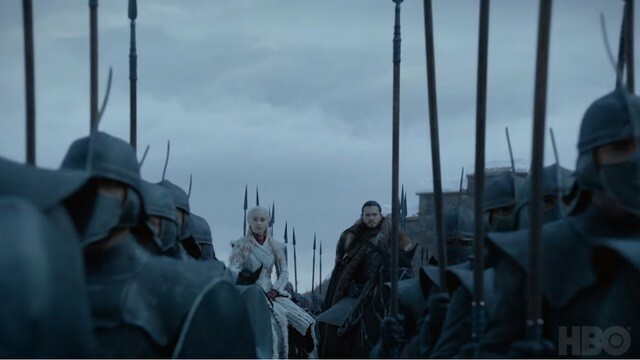 From there, you get serene shots of dragons over Winterfell, Jon Snow and Daenerys keeping tightly together in sweet, incestuous love, Cersei Lannister preparing her forces for some sort of battle, and of course, a very brief white walker battle tease. The new season of Game of Thrones begins April 14. Watch the trailer below.